Opening this weekend on Governors Island in New York City is "Pioneers of Change," a festival of Dutch design, fashion, and architecture hosted in eleven abandoned former officers' houses as part of NY400, the celebration of the 400th anniversary of Henry Hudson's voyage to what would eventually become New Amsterdam. "Pioneers of Change" offers a variety of really interesting work in an assortment of media, even a pop-up design store. But what we went there for, and what you should go there for, is the "Go Slow Café," a project by Droog with Marije Vogelzang of Proef Amsterdam, sloom.org (Rianne Makkink and Herman Verkerk), and Hansje van Halem. 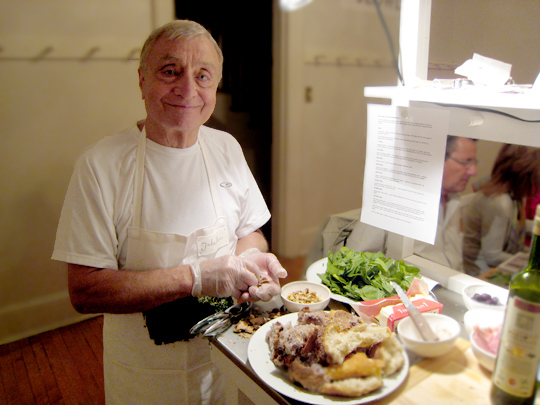 The "Go Slow Café" offers a different kind of "slow food," in which elderly people of New York (volunteers!) prepare and serve food slowly, with attention and care. 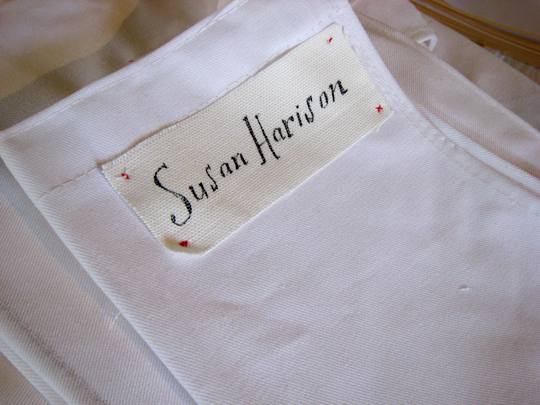 Its aim is to accentuate ordinary aspects of dining and eating for "a renewed appreciation of details and processes." 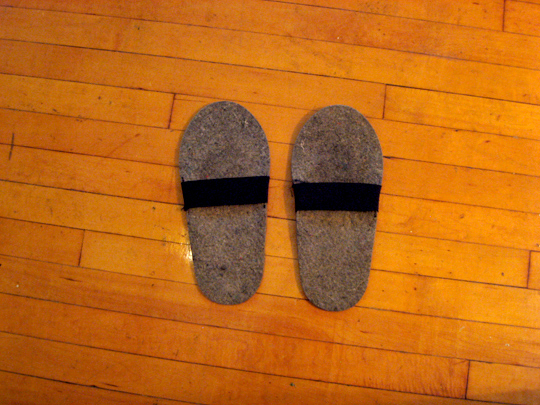 Upon entering, you're suggested to wear the provided slippers. Upon sitting down, you're greeted warmly and told that you'll be treated as though you were "visiting our grandmother's for dinner." The tranquil setting and deliberately slow pace transform the dining experience: for example, tea bags are hand-sewn, the mint tea must be steeped, walnuts are presented and cracked to order, even the cutlery is a challenging impediment, causing you to struggle a bit with your food. 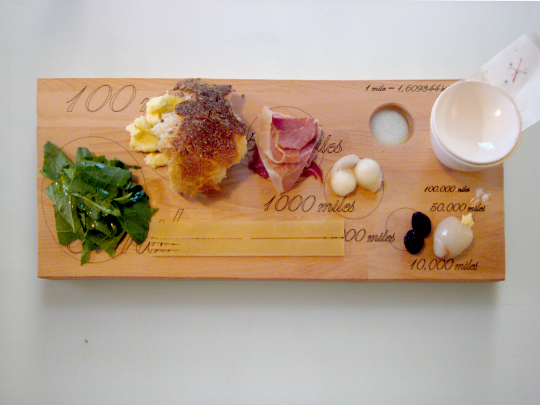 The menu and the wooden plate visualizes and physically expresses transport and distance: local food is served in generous portions and food, while ingredients from far away are served in progressively smaller portions. At the most local level (and the largest portion), is baby cress: grown on-site and literally worn by the staff on their aprons, it's clipped and combined with mustard greens from the recently hip Rooftop Farms in Greenpoint, Brooklyn. Then on to cheese from Tennessee, ham from Kentucky, walnuts from Chile, olives from Turkey, a lychee from China, butter from Russia, and finally, star dust. 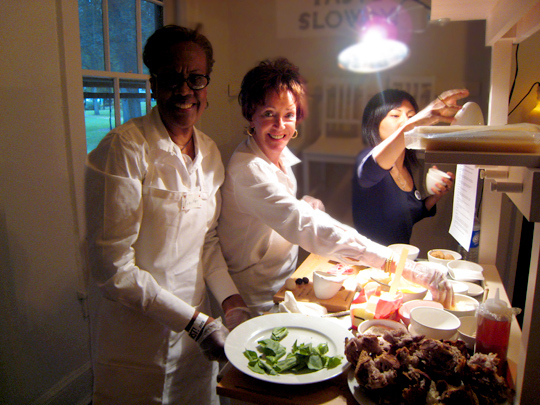 "Slow Food" sign. 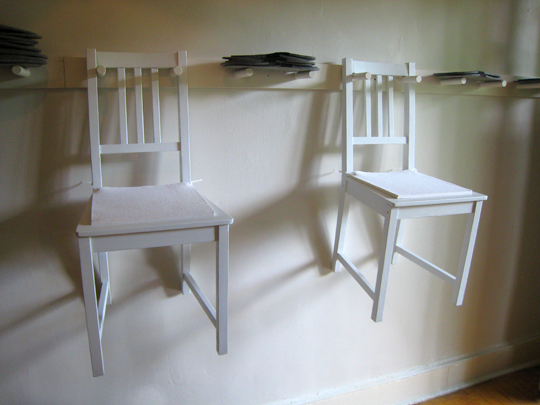 Design by Hansje van Halem. Photo: Raphael Brion. Forcing you to conceptualize food miles, you play along, appreciating and savoring the distance, especially with the walls reminding you in huge letters to "CHEW SLOWLY" and "SWALLOW SLOWLY." The serene, leafy-green alternate universe that is Governors Island (only a seven minute ferry ride away from Manhattan) is an absolutely ideal location for the Go Slow Cafe: the island itself is a sort of sedative, slipping you into a dream-like state the second you set foot on it. The Go Slow Cafe capitalizes on that, itself designed and engineered to calm — on two levels, you're disconnected from the hustle of New York City. You're asked to give in to the entire concept, to un-hurry, and therein find a true indulgence, a luxury, of slowness. At the same time, you become part of the art piece, with people dropping in — the front door is open — and visiting the space while you eat. 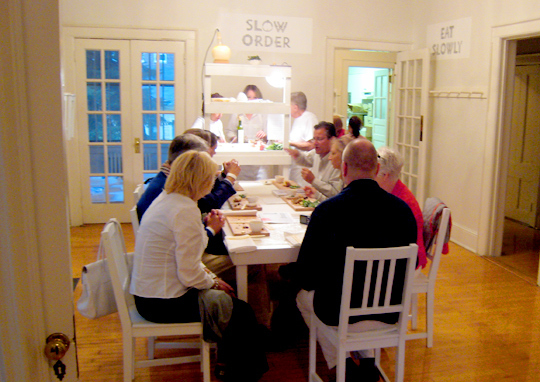 The Go Slow Café is only part of "Pioneers of Change," and the entire festival is highly, highly recommended. 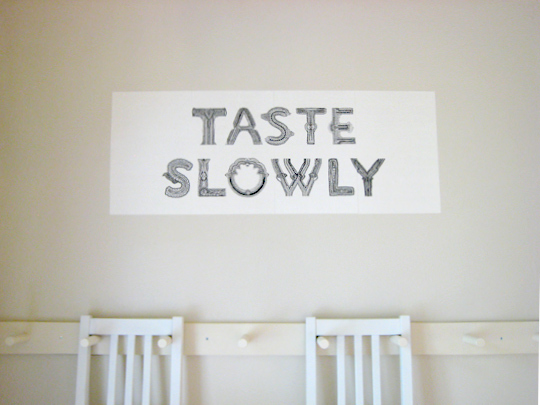 "Taste Slowly" sign. Design by Hansje van Halem. Photo: Raphael Brion. The ladies. Photo: Raphael Brion. 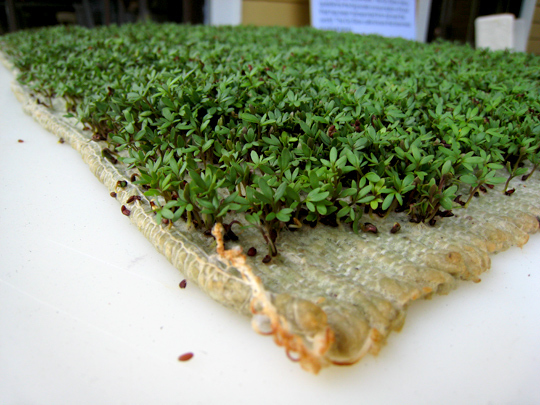 Baby cress. Photo: Raphael Brion. 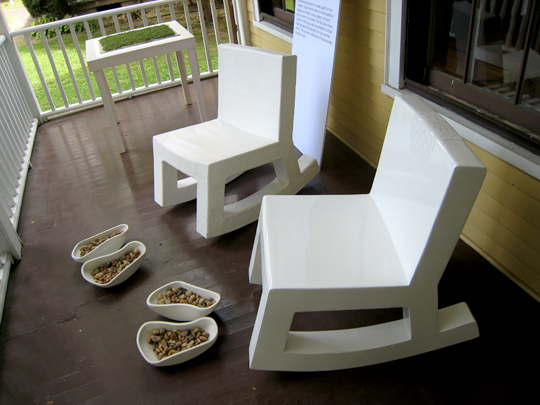 Rocking chairs by Ineke Hans, foot rests by Noriko Yasuda. Installed for relaxation. Photo: Raphael Brion. 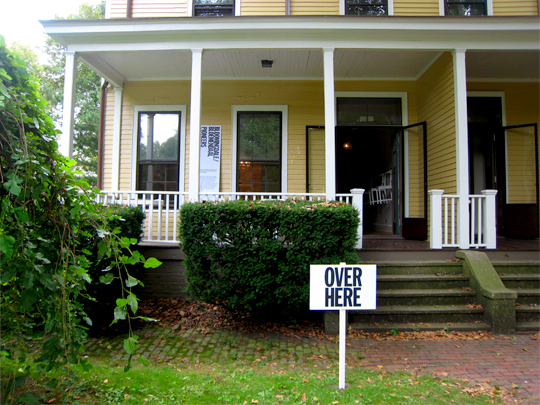 Pioneers of Change runs Sept. 11-13 and 17-20, on Governors Island. The Go Slow Cafe is in House 8A: Bloomingdale/Bloemendaal. Great to see your story here! Today it's rainy so the seniors are sitting inside making a monster-production of hand-sewn teabags! Tea sounds about right for this kind of weather! Sounds amazing. And, further proof of the experience... everyone looks incredibly happy.I love anything where slippers are encouraged ,slowing down the mantra,and cracked to order nuts?In. 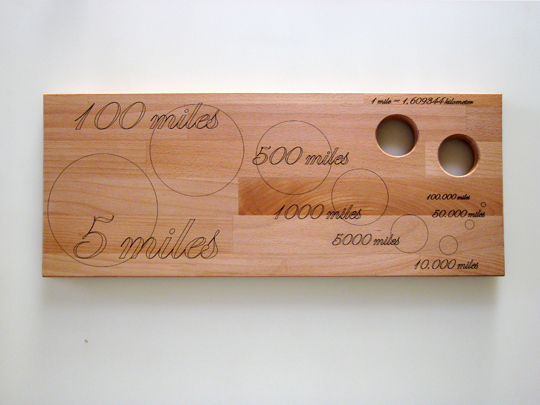 the woodenplates are really cool. i like the concept of distance /effort to portion ration. very thoughtful. "challenging impediment". 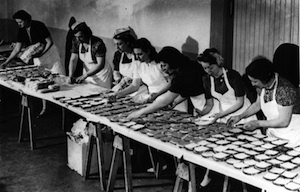 what was the cutlery made of? 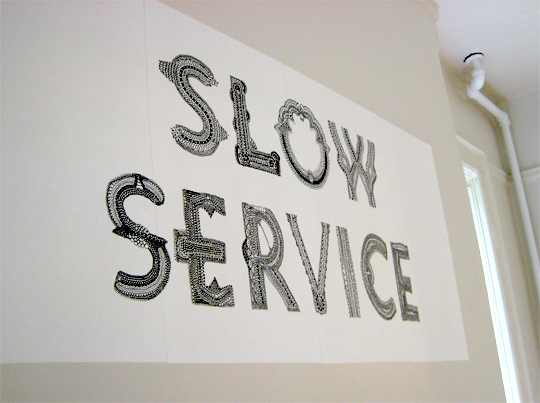 what a radically political concept - go slow - and how much we need that. 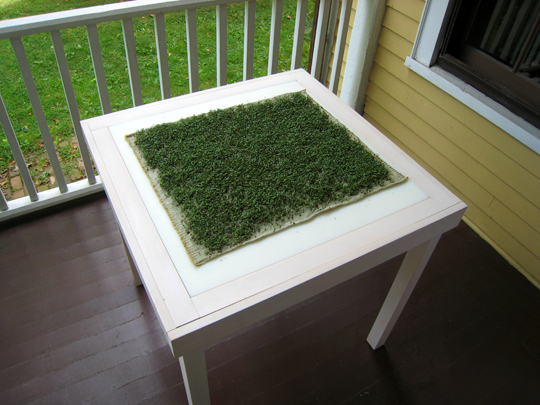 the wooden plates are wonderfully concrete ways of making one aware of sources of our food. This project has been interrupted (and possibly shut down shamefully methinks) by the New York City Department of Health (or some such agency). So much for welcoming the Dutch and their good ideas to New York. Hi, I just checked back in - it was just a minor issue but the Go Slow Cafe is still open for business!